The potassium-chloride cotransporter KCC2 might seem an unlikely target for the next generation of pain medications. The humble protein, found on neurons in the dorsal horn of the spinal cord and throughout the central nervous system, serves the mundane task of pumping chloride out of cells. But KCC2 has recently emerged as a key regulator of neuronal signaling. A new report from Yves De Koninck and colleagues at Université Laval and Institut Universitaire en Santé Mentale de Québec, Canada, now debuts a compound that bolsters KCC2 activity and normalizes cell electrophysiology as well as pain hypersensitivity in a rat model of neuropathic pain. The research was published online October 6 in Nature Medicine. Michael Salter, a pain researcher at the Hospital for Sick Children, Toronto, Canada, who was not involved in the current work, called the research elegant both conceptually and practically. “This demonstrates how [the pain field] has come from an observation—of a loss of neuronal inhibition—all the way to identifying a molecular change—in this case loss of KCC2 activity.” In the new study, he said, the authors have established the concept that KCC2 is a tractable pain drug target. “They determined what was wrong, and now they have found a compound that affects the problem and works in vivo” to attenuate pain hypersensitivity in an animal model. The problem arises when KCC2 activity falls following downregulation by brain-derived neurotrophic factor (BDNF), a key intercellular signaling molecule. The source of BDNF and the events leading up to loss of KCC2 activity vary; the deficit has been shown to underlie aspects of pain conditions including neuropathic and inflammatory pain as well as morphine-induced hypersensitivity (see PRF related news story; Zhao et al., 2006; Beggs et al., 2012). Loss of KCC2 activity has also gained ground as a mechanism underlying other CNS disorders such as epilepsy and schizophrenia (Kalkman, 2011; Löscher et al., 2013; Kahle et al., 2008). Accordingly, KCC2 has become an attractive target for development of CNS therapeutic drugs (De Koninck, 2007). The new report provides the first inkling that targeting the cotransporter could be a fruitful treatment approach. Without KCC2 activity, chloride accumulates inside cells, and the chloride gradient collapses. This changes the reversal potential of ion channels that pass chloride, such as the main receptor for the inhibitory neurotransmitter GABA. Chloride ions normally flow down their electrochemical gradient into cells to hyperpolarize the membrane potential and inhibit cell firing, but the collapse leads to a less efficacious inhibitory current. This loss of inhibitory signaling in the spinal cord is thought to contribute to the pain hypersensitivity that accompanies neuropathic pain. De Koninck and his team searched for compounds that could either increase KCC2 expression at the plasma membrane or could increase chloride efflux through individual transporters. First author Martin Gagnon and colleagues began by developing a high-throughput assay to identify compounds that affected KCC2 transport in cell lines. NG108 cells proved the best cell type to assay activity, as they naturally express the transporter at low levels. HEK293 cells, in contrast, express other chloride transporters but not KCC2. After screening 92,500 compounds, they identified 78 that increased transport activity in the NG108 cells. After further selecting for compounds that did not boost transport in the HEK293 cells, indicating that they affected KCC2 specifically, the team zeroed in on a handful of compounds including CLP257. 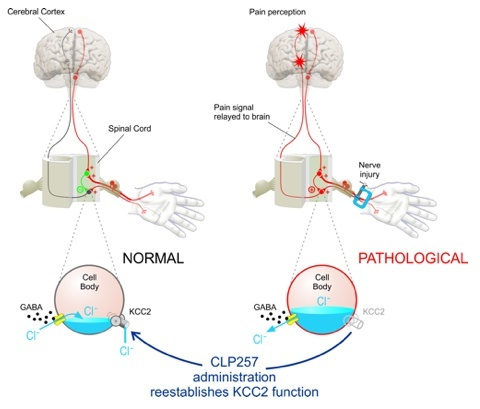 To determine whether CLP257 could affect KCC2 transport in native cells, the researchers made spinal cord slice preparations from rats with peripheral nerve injury (PNI), a model of neuropathic pain, or from control animals. The healthy control slices were then treated with BDNF, which downregulates KCC2 in models of pain hypersensitivity. A fluorescent indicator dye showed that in both preparations cells transported significantly more chloride in the presence of CLP257, indicating that the compound restored some of the cells’ lost chloride extrusion capability. To see how CLP257 could help cells under duress, the investigators boosted chloride levels inside the spinal cord neurons to challenge KCC2. “We created a chloride load to see how much the cell is able to fight that load,” De Koninck said. From those cells, they recorded currents through GABA receptor channels and determined the reversal potential of those currents. Spinal cord neurons from both PNI and BDNF-treated slices had a depolarized reversal potential—as a result of chloride accumulation—that was shifted to a more hyperpolarized potential by CLP257, indicating that increased chloride extrusion had helped restore inhibitory GABA signaling. The chloride load was important to the experiment, De Koninck said, “because it gives an actual measure of cells’ extrusion capacity,” rather than simply measuring GABA reversal potential under normal resting conditions. “The deficit in extrusion can be subtle and may only show up with a chloride load,” he explained, such as might accumulate with repeated neuronal firing in the spinal cord. De Koninck and colleagues recently published a study modeling how, without KCC2 activity, a barrage of inhibitory input can initially hyperpolarize the cell, but inhibition fails as the chloride gradient collapses (Doyon et al., 2011). Although future research will address exactly how the compound affects KCC2, immunoblotting experiments suggested that CLP257 increased trafficking of existing KCC2 protein complexes to the plasma membrane, rather than bumping up activity of individual transporters or affecting gene transcription or translation. The team will continue to pursue other compounds that might affect KCC2 function more directly, De Koninck said. In normal cells, KCC2 activity keeps intracellular chloride very low, so a drug that increases KCC2 levels on the cell surface would be expected to have only minimal effects on normal function. Instead, Salter explained, boosting KCC2 should only rescue a loss of inhibition. “A constellation of factors have come together to make this a good way to affect CNS activity only in an abnormal situation without affecting normal inhibitory transmission,” he said. That sets potential KCC2 enhancers apart from other drugs that affect inhibition throughout the brain, like GABA-enhancing benzodiazepines. Finally, the researchers tested CLP257 in vivo. Evoked field potentials—measured electrophysiologically in the spinal cord in response to peripheral mechanical stimulation—were heightened in rats that received PNI and normalized by CLP257, which had no effect on evoked responses in control rats. Similarly, a dose of CLP257 increased PNI rats’ withdrawal threshold to mechanical stimuli. After slightly modifying the molecule to slow its metabolism by the body, the researchers found that it was as efficacious as pregabalin, a drug currently used to treat neuropathic pain. The compound appeared safe even at high doses; common tests for toxicity or motor effects were all normal. Chloride extrusion enhancers as novel therapeutics for neurological diseases. Nat Med. 2013 Nov; 19(11):1524-8. Epub 2013 Oct 06. P2X4R(+) microglia drive neuropathic pain. Efficacy of synaptic inhibition depends on multiple, dynamically interacting mechanisms implicated in chloride homeostasis.